As part of ongoing studies of the nature and distribution of Permian glacigene sediments on Fleurieu Peninsula, we were shown to a location just below the plateau surface near Spring Mount, west of ‘Minnawarra’ Homestead (Fig. 1). Here, on a north-facing spur high in the landscape, adjacent to scattered outcrops of extensively weathered and ferruginised bedrock, there was a surface scatter of rounded cobbles and pebbles cascading down towards a small dam in the valley. 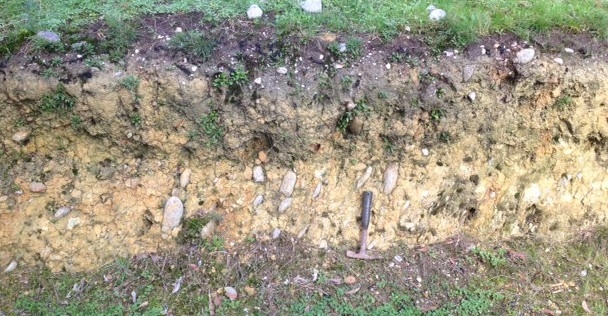 We would normally be looking for just this type of geological occurrence as evidence for Permian glacigene sediments from which the cobbles and pebbles (erratics, outwash gravels) would have been eroded. 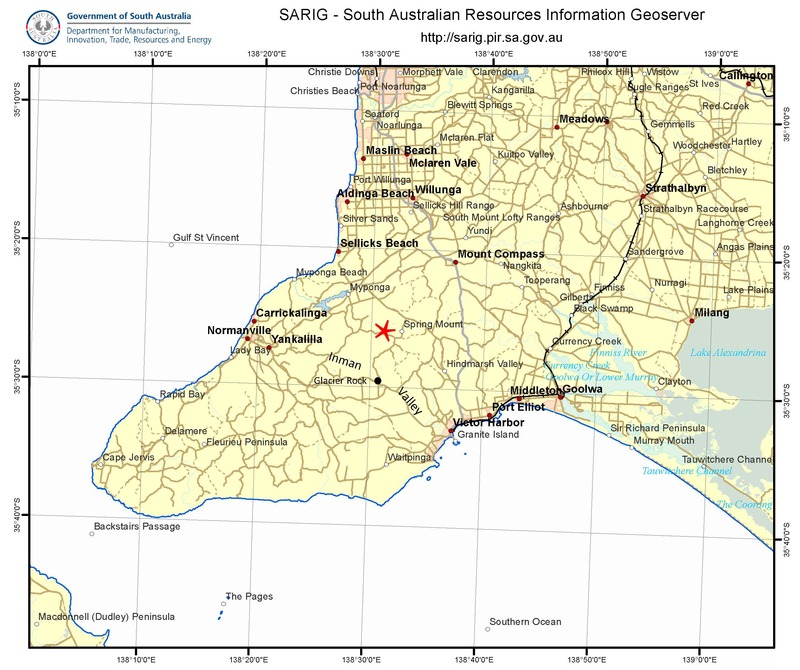 This site was somewhat removed from the usual locations of Permian sediments that are common nearby at lower elevations in the Inman Valley to the south, and in the Hindmarsh Tiers and Myponga valleys to the north. Nevertheless, the scatter of rounded clasts was distinctive. Figure 1: Location map. Site studied marked by red star. On closer examination, the clasts were commonly of quartzite and fine-grained gneissic rocks but we could not identify any granite cobbles: boulders and cobbles of Encounter Bay Granites are very common in the Permian deposits along the northern margins of the Inman valley, for example. In addition, many of the cobbles and pebbles here were somewhat oblate in shape. 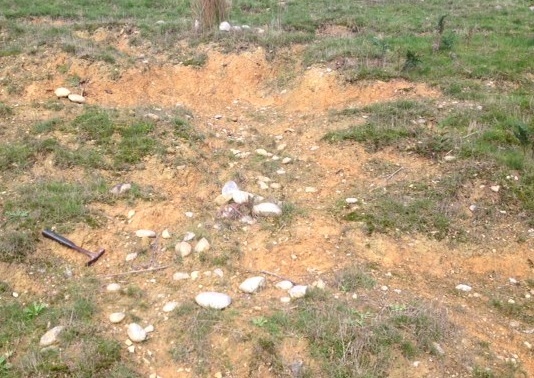 We traced the scatter of clasts downhill towards a small dam. On the eastern side of the dam a shallow cutting had been made in the hillslope to provide vehicular access to the dam. Figure 2: Pebbles and cobbles eroding from a bleached and weathered sand-silt material exposed at the base of a Xanthorrhea. Figure 3: Scatter of pebbles and cobbles eroding from a bleached, weathered and somewhat ferruginised sand-silt material. Note the oblate character of many of the cobbles. 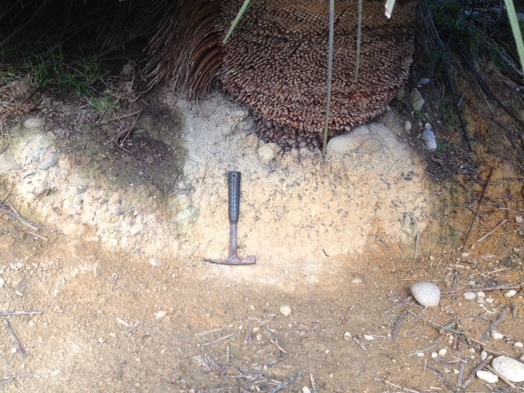 Various exposures en route to the cutting, for example on the downslope side of a Xanthorrhea (grass-tree), revealed cobbles and pebbles weathering from a bleached, weathered and generally poorly consolidated sand-silt matrix (Fig. 2), which is very like the situation we have observed in Permian glacigene deposits. First observations on approaching the cutting by the dam confirmed these relationships (Fig. 3). At the cutting, however, the actual field relationships of the clasts and the matrix are more clearly seen and the clasts tend to have a well defined ‘imbricate’ orientation in the host matrix (Fig. 4). Immediately to the east in the cutting the relationships become clear: the clasts are actually contained within steeply dipping weathered bedrock. Their oblate shape and orientation is a function of deformation of the bedrock and they are aligned parallel to the steeply dipping layering represented by schistosity roughly parallel to bedding (Fig. 5). The weathering of the bedrock, which is related to its occurrence in close proximity to the deeply weathered pre-Tertiary summit surface of Fleurieu Peninsula, and which is particularly characteristic of the area around Spring Mount, has extensively altered the rock matrix but apparently little affected most of the contained clasts. Some outcrops in the small tributary immediately to the west of the dam are of weathered and ferruginised schist and gneiss, but there are no rock clasts evident. Figure 4: Pebbles and cobbles with a clearly defined ‘imbricate’ habit within the bleached, weathered and somewhat ferruginised sand-silt matrix. Figure 5: Pebbles and cobbles, now seen as significantly deformed parallel to the cleavage in steeply dipping bedrock which has been strongly altered by weathering. 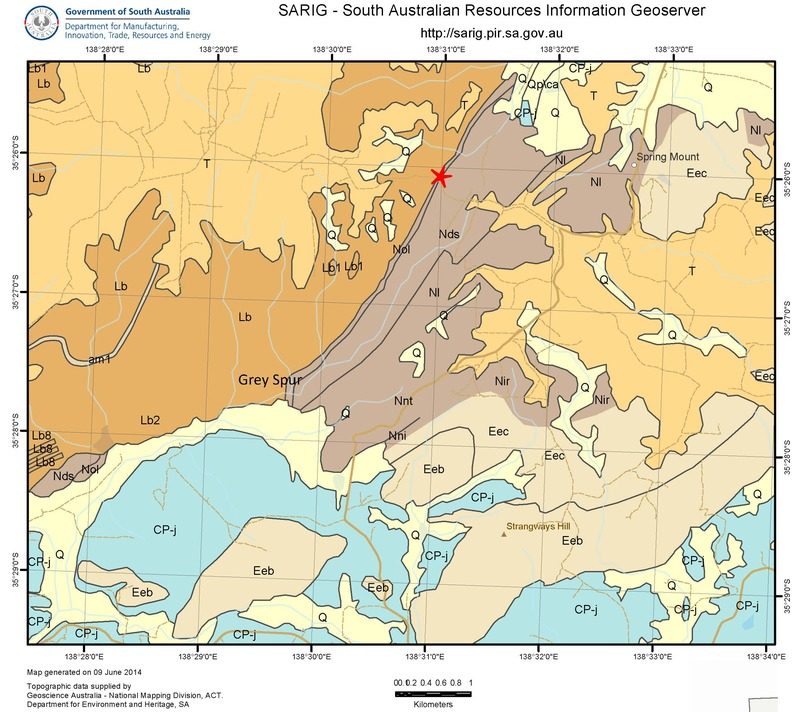 Clearly, the geology is not reflective of Permian glacigene deposits but of weathered and altered bedrock most likely to be the basal Proterozoic conglomerate that unconformably overlies the Barossa Complex basement inlier in this region. Reference to the geological map (Fig. 6) confirms this possibility. The essentially unweathered conglomerate, which is also spectacularly deformed, is well-exposed in the Inman Valley at Grey Spur, just south of the Spring Mount locality. The same formation (assigned to the Aldgate Sandstone; SARIG mapping) is exposed on the coastline at Lady Bay, south of Normanville, but the deformation here has been very intense and the contained cobbles and pebbles are significantly deformed. The ‘lesson learned’ is that all is not as it initially may seem in field geology, and jumping to conclusions is not recommended. A close examination of field relationships in any locality, together with questioning of initial conclusions and gathering of all available evidence, might actually uncover an interesting story that would otherwise be missed. Figure 6: Geological map showing site location (red star) and distribution of basal Proterozoic conglomerate (Nol Aldgate Sandstone). Geology as follows: Orange-brown (Lb) = basement Barossa Complex; dark brown (NoI, Nds, Nl etc) = Proterozoic; pale brown (Eec, Eeb etc) = Cambrian Kanmantoo Group; blue (CP-j) = Permian glacigene sediments; orange (T) = undifferentiated Tertiary weathered zone materials; yellow (Q) = undifferentiated Quaternary alluvials. This entry was posted in Geology education, Permian glacigenes and tagged Fleurieu Peninsula, Inman Valley on June 11, 2014 by tony milnes. Well done. Just one comment you should ad the classical localities of Glacier Rock, Imman Valley and others on map fig 1. Thanks, Medard I will do.